this was disgorged in January 2011.
gunflint and citrus lemon with fine delineation. The palate is quite sharp and citrus-like on the entry. R.D. stands for "Récemment Dégorgé", recently disgorged: Madame Bollinger created this legendary vintage in 1967, giving the world the opportunity to taste a champagne aged on lees for an exceptionally long time. Her great vision? Enabling knowledgeable wine connoisseurs to share a very special moment, when very recently disgorged wine is as fresh and aromatic as ever. It was a small revolution in the world of champagne. 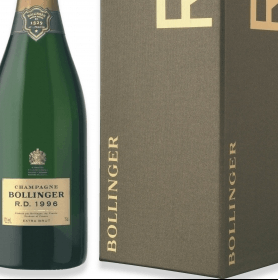 The daring Bollinger R.D. could only become James Bond’s favourite champagne.